Moon River Music Festival confirmed Monday the full lineup for its two-day fest taking place Sept. 7-8 in Chattanooga, Tenn.’s Coolidge Park. Headlining acts include Jason Isbell and The 400 Unit, and Americana singer-songwriter Brandi Carlile, who recently enjoyed an award-winning sweep of the 2019 Grammy Awards. Other notable acts on the bill include indie-folk group The Oh Hellos, five-piece, roots-influenced alt-rock band Moon Taxi, and Lady Wray, the sultry songstress crooning R&B ballads with a retro flair. Founded in 2014, the two-day homage to Americana returns after a move from its original home of Memphis to Chattanooga in 2018, a lineup which sold out in just eight hours. Drew Holcomb, the festival’s founder, will also host a Songwriters In-The-Round event with Heather Morgan and Marcus Hummon on Friday, Sept. 6 at Chattanooga’s historic Walker Theatre. Tickets will be available exclusively to Moon River Music Festival attendees while supplies last as an add-on. Moon River tickets will go on sale to the public beginning at 10 a.m. ET on Wednesday, Feb. 13. 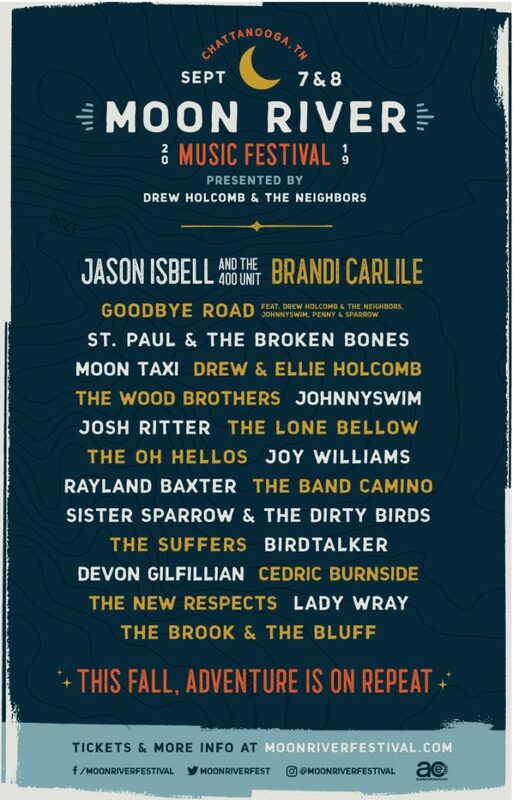 Check out the full lineup below, beneath vintage Carlile and Isbell performances from the Paste archives.